The GM plant in Lordstown, Ohio, which only builds the Chevy Cruze compact car, already went through layoffs in 2017 when it trimmed its three shifts to two shifts and cut 1,200 workers, due to what GM said at the time was change in consumer preference from cars to SUVs, crossovers, and pickups. These cuts brought the workforce at the Lordstown plant down to about 3,000 employees — 2,700 hourly and 300 salaried. Now the number is going to get cut in half. In a 3 p.m. meeting on Friday between employees and management, workers learned that production will be further cut to just one shift, according to 21 News WFMJ in Ohio, based on “several sources inside the meeting.” Approximately 1,500 positions will be eliminated. For the industry overall, car sales so far this year are down 10% from last year. Last year, they were down 11% from 2016. In 2016, they were down 8% from 2015. Throughout, sales of “trucks” have boomed, as consumers have switched from cars to SUVs and to compact SUVs (crossovers), which are based on a car chassis but are classified as “trucks.” A good dose of $6 or $7 gasoline might halt or reverse that process — or might instead push consumers into electric vehicles. During the Friday meeting, employees were told that the company would offer a $60,000 buyout to workers who are nearing retirement and a smaller buyout to workers with less seniority, according to 21 News WFMJ. Informational meetings are scheduled for next week to notify workers of the buyout options. There is another wrinkle to this story. In March 2015, GM announced a $350 million investment at its plant in Ramos Arzipe, Mexico, in order to start building the Cruze at that plant. The Cruze is sold in 100 countries and built in about seven countries, including Mexico and the US, and production at the Lordstown plant wouldn’t impacted by production in Mexico, GM said. At the time, the Lordstown plant was running three shifts. So OK. 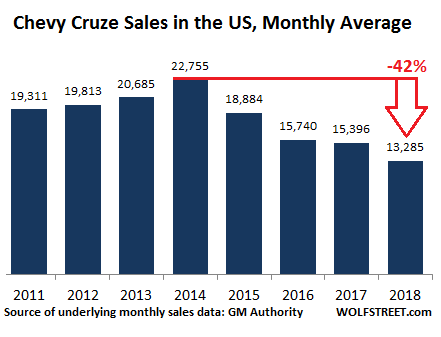 Which is a confusing sort of demand because Cruze sales fell 17% in 2016 from 2015, despite incentives being heaped on the car to get it moving. In early 2017, the third shift at the Lordstown plant was eliminated. And now the second shift will be eliminated. Leaving just one shift and an iffy future for the plant. GM making the hard decisions unlike Congress who should have let them go under. Outsourcing to Mexico is an easy decision. Like the illegal obama bailout that destroyed 200 years of contract law? It’s not like GM has been competing on a level playing field. For decades Japan has been manipulating its currency to give its car companies an advantage in the U.S. market. You can’t repatriate profits from overseas if you have a strong currency. And I might add, a weak yen makes things like food much more expensive than it needs to be. Just think of the millions of little old ladies who have to count their pennies so Toyota can sell a Lexus at a profit. That said, even Ford is going to build the new model Focus in China and ship it back to the U.S. Talk about bad timing. If the car companies keep outsourcing jobs abroad, there’s going to be a backlash. That backlash so far has taken the rout of an Opioid crisis. This story of a trained machinist https://www.npr.org/2017/02/27/517563200/rexnord-finalizes-plans-to-move-indianapolis-jobs-to-mexico directly shows how the world as we know it works. The elites running the manufacturing ship the jobs to China & Mexico and the $25/hr job as a machinist in Ohio, becomes the $3 / hr job in Mexico. https://www.ug.edu.gh/economics/ the light bulb may start to go off somewhat faster..
Globalism is working for those that are orchestrating it. Maybe we should start outsourcing some CEO jobs? Lots of savings to be had there! American manufacturing is not near Japan’s. It really is that simple. American consumers have been telling you this for years. It is ironic that the American proponents of free trade couldn’t forsee the effects on their own economy. Trump has done so but far after the horse has bolted. Honda, Toyota, Nissan, BMW, Volkswagen, Daimler, etc. have big manufacturing plants in the US. There’s nothing wrong with American manufacturing in terms of quality. And consumers like it just fine. This is strange. When a significant number of people are reportedly living paycheque to paycheque, who is so cashed up to be affording heaps of these behemoth trucks? Those in the “gig economy” sleeping in their cars in Walmart car parks? Forget the petroleum product costs, these things (SUVs) are very costly to maintain. Tires for them can be up to four times the cost of a normal sedan. On Oprah, there was Suze Orman. Around the time of the great recession, she did her famous “smackdowns” which I loved to watch. The typical scenario was that he’d just lost his job, her part time job was not covering the bills and they had USD30K in credit card debt. So what did they do? Since two cars in the McMansion were not enough, they went out and bought an SUV and possibly a kitchen renovation just to be on the safe side. The lenders couldn’t splash money at them fast enough. Of course Suze gave them a proper smackdown on national TV and I got my schadenfreude fix for the day. These behemoth trucks (SUVs: should be called SUX) also chew up the roads and damage kerbs thus adding to the costs to maintain aging (in some cases: falling apart) infrastructure. My guess is that GM is just continuing its corporate policy of jobs export under a convenient excuse. Living beyond ones means is just such a wonderful thing when most of the country does it; leading to “fake prosperity.” Since we have fake news and fake everything, I guess it is in keeping with the times. William Smith – You took the words right out of my mouth. Who’s buying those things? And what about Joe Lunchpail, living paycheck to paycheck and is buying a car from a “Buy here – Pay here” lot? Aren’t there legions of Joe Lunchpails out there who’d love a cheap, reliable, car like the Cruze? I’m really surprised they’re not selling like hotcakes. I certainly see a lot of Sparks, Leafs, Prii, Coopers, Smarts and such things in my area. I guess what I wonder is, is the Cruze in particular doing badly, or are small thrifty cars in general doing badly? Who is buying those things? Cheap and easy money that is eventually guaranteed by the taxpayers. Generally speaking, everyone except the Civic is getting killed. Because people are idiots. They pay twice as much for a truck they might need 2 or 3 times a year to actually do truck things. They can get a car for $15k and rent a truck for say a $1000 total for the year for the times they need a truck. Instead, they pay $30k for the truck and then have to also pay twice as much on insurance, gas, maintenance. Try $50k my man. My boss does this. Buys a $50k GM truck with the same diesel engine used in humvees because it’s “manly” or something when the best thing for what he actually does would be one of those “business” vans, preferably with crank up/down windows, like the businesses around here use. He almost never needs the open bed of a pickup, and when he does, he’s generally renting a trailer from Dahl’s anyway. Beats the truck all to hell instead of keeping it maintained … Oh and he bumps into other vehicles and things occasionally … a big white van would be easier for others to see and avoid, cutting his oopsies by 50%. New cars, new phones, trips, and so on. If 70% of the country is living paycheck to paycheck, who can buy this stuff? Derek – it’s because everyone’s buying that stuff on time. If it wasn’t for loan-funded purchases, this consumer-driven economy would probably crash. The average amount people have in savings isn’t very high. The loaded GVW for the largest of these vehicles (300 series pickups) is about 8,000 pounds. A loaded 18 wheeler weighs up to 56,000. More appropriately, they should be called STD’s…. Would never buy a North American car, but rented a Cruze a while back. I will say I did not hate it, which is a rather high compliment from me. That said the shift to larger SUVs and trucks is a crime. The trend is apparent in a number of places but in the US it is totally out of control. It is driven buy greed (consumerism), artificially low interest rates, and ultra cheap US gas prices. When I drive my sedan in the US I feel like a midget. To get people to buy reasonable sized cars, it is time for the US to price gas at its true cost (for one, the cost of running the military should be paid at least in part from gas taxes). And some more of a higher gas tax should go to maintaining the roads which in some states are barely driveable. Going through Michigan one feels like one is getting a free all body massage while playing dodge the car eating potholes. Anyone with a brain knows you are right. It is the only tax that the Arabs would have to pay. Since our politicians respond to their lobbyists who work for their bosses in Riyadh and Jerusalem don’t count on it. That’s an outdated conspiracy theory. The US is an energy oil&gas superpower in it’s own right once again. Nicko – have you taken a look at the depletion curves on fracking wells? Scroll down to the March 2nd 2018 post. What I find interesting is that production at Eagle Ford approximately halved since 2014/2015 and the aggregate up-trend only exists due to moving on to new sources. These will also deplete over just a few years, if the Bakken and Eagle Ford trends are representative. As for coal, well, I don’t want to see the environmental devastation that would accompany that becoming our new primary source of energy. Not just the Cruze, even the Honda Accord sales are down 15.8 percent with the new body style. Honda Accord and Toyota Camry were the preferred cars for those driving Uber full time a couple of years ago. Is it possible that the new drivers are not joining Uber fast enough to keep pace with the sales of past two years? Basically, if you’re driving for Uber you’re desperate. You’re lucky to make min. wage, and word *is* getting out. I suspect gm has been pushing their cars on subprime folks and since that party has ended, it is time for gm to go home. I wonder when Ford will have a similar story what with badly engineered cars but loaded with gadgets. How do you know when a car company is in trouble? When they want to ape Silicon Valley and think it is more important for the driver to interact with social media while driving instead of fixing their low standards of manufacturing. So ford wants to copy Scoop, build self driving cars, and compare their cars to honda and Toyota ones in terms of gadgets on board. This is just a labor-cost-reduction program. Otherwise, why the buyouts for permanent retirement? If the story about SUVs is true, they’d want to keep skilled labor at ready (temp layoff) for after the factory is retooled for SUV production. Or, maybe they intend to close it permanently? Blaming consumer preference is a red herring. There are plenty of people who’d happily drive a new Cruze for $250/mo., and GM could get there with its old SmartBuy trick. You get keys, a heater and your choice of color as long as it’s white. Honda does this with the Civic. Maybe that’s why its sales have remained stable. Is not consumer preference. People tend to kerp the same car a lot longer when the economy is doing bad. Trucks are selling well because there is a demand for trucks. How long that demand will last I have no clue. Hey Wolf, why is demand for trucks so high? Might warrant it’s own article. A poker buddy…. nice guy, a few bucks, bought a Ram truck a while back. I threw a bale of straw in the box when he wasn’t looking so, as I told him to his face ( we are friends) that he could pretend to be a pretend rancher. He has had a semi- serious load of yard waste in the box maybe a dozen times in a year. He is a little PO’d at the price of gas though. A hundred (C$) no longer fills it up. This is certainly true in Texas where trucks are king, regardless of whether you need one or not. Amazing to see so many gas-guzzling pickups and SUV’s with a single occupant in them and no cargo. Obviously many of these drivers could get buy with passenger car or minivan, but that wouldn’t be appropriate for appearances. Exactly. Even more absurd to see fleets of gargantuan full-sized pickups rolling in and out of downtown Dallas every day as people….. drive to their white-collar jobs. I care nowt what other people do. Tis their right to be stupid. But stupid it indeed is. It’s the culture. I wonder, what percent of country western songs have some reference to a truck – conservatively, 20%? Gals in the South want a guy with a cowboy hat, a guitar and a truck. 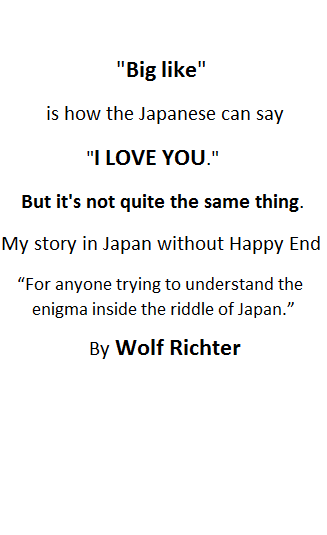 What’s so difficult to understand about that? I am actually one of those rare individuals who could/would use a full size truck. I live rural, heat with wood, own and work property, am building a home (requiring material purchasing runs to town), and pull a boat for 3 months of the year. (I built the boat). I have been contemplating replacing my 32 year old Toyota 4X4 PU with a new Colorado or Sonoma mid-size PU (GM products). Then I get out the calculator and forget all about it. It’s the same with a tractor. I would use a small backhoe every 2nd day if I had one. Instead, once every few months I hire a guy and pay him cash which keeps my money in the bank. I am a definite truck user in all ways, but we use a Toyota Yaris for almost all our needs. I can hire a large flatbed truck with a hyab crane to haul a load of materials from town for $200 per run. The yard does all the work, the crane sets the materials exactly where I want them, and I save a 1/2day of needless driving and waiting around. Plus, their truck hauls 10X what a PU could haul. If you add up the operating costs of a PU; fuel + insurance+wear and tear, my hired truck maybe costs $100 per run. I have even hired them to haul hydro poles. New trucks are wasteful in every sense of the word. My $5.00 calculator emphasises that fact without breaking a sweat. In fact, the money we save by not having a decent/new truck allows us to own and operate the Yaris free of charge. Think Chevy Cruze. It is a real convenience for my wife and I having two sets of wheels and we still save on top of those costs by not running a truck. Next week I will insure my Honda 500 CBX motorcycle. It allows me to make town runs in 1/2 the time for $8.00 return. It is also 10X the fun!! I would guess a Cruze would/could replace 95% of the pickups on the road. Have you seen the resale values on used Toyota Tacoma trucks? They are insane. If you need work done on V6 engine there’s two banks of cylinder heads and thus two sets of gaskets / valve covers etc. Yet the market for 1980’s era cheap Toyota Pickup has them priced in good shape at north of $4 – 5000 /vehicle. We saw a 14 year old Tacoma recently for sale with 105,000 miles and a California car with sticker shock of $11,000 it doesn’t add up. Yet that’s where the market trades for the Tacomas. We have a 2002 GMC 2500 Sierra with a diesel engine for pulling a trailer with, and its been my experience that its a great truck. Trucks just seem to last longer. People don’t want Camries any more.. They want a better quality vehicle..
Paulo – Years ago I bought a large lot of electronics surplus, in fact the biggest deal I did, ever, for $1000. With the help of a friend (hint: an awful lot of us white guys look alike) I rented a truck from Home Depot so I had an F350 size truck with a custom bed, that could carry 2X the stuff a stock F350 could, and I moved the stuff in two loads, costing me $50 and a case of beer, and a bunch of orange juice on the other end, to load/unload. And when I took the truck back, it wasn’t charged by the day but by the hour, and it only cost me about $50. 10/10 would rent again. It’s more complicated than that when majority of cars are leased, most people don’t have money to buy it back at the end of the contract and won’t be able to hold on to it. Remember that lease monthly payments are heavily dependent on used car values and it looks like pefect storm might be brewing, the more lease cars return to secondary market, the used car prices will fall, lease payments will increase to make up the difference of the new car price minus used car price, add rising interest rates, or god forbid recession. As mentioned by other people on here, presumably people are keeping their cars longer, same in the UK. Trucks too, my friend, and it’s not always about cowboy hats, women and song. I’ve been in the cow-calf business for 40 years (semi-retired now) and my 1995 250 Dodge diesel is still in service, although the hitch ball for a gooseneck cattle trailer is little used, anymore. Agreed RD why pay for a newer vehicle if your 95 Dodge still works. Ps It should be about cowboy hats, women and song ha ha. Regards Steve UK. I too drive a 1992 Silverado 3/4 ton for cow/calf ranch operation. Had a 1992 Silverado 1/2 ton for city driving that was at 375,000 miles when I sold it. I have access to two 2012 2500HD diesel pickups (my two sons) for pulling the cattle trailers. Yes I wear a cowboy hat, play country music guitar and already got the best woman. Living the cattleman’s retirement dream. End of comment to RD. Anyone can criticize another person choices in vehicles or anything else for that matter. Doesn’t mean they are right. The best car is one that id fully paid for. Hence another reason why car sales are down. Some people won’t buy a new car until the one they have is paid in full. After buying a house in 2008 days before the crash and taking a pay cut in 2009 I bought a used BMW 330 as a “stop gap” measure until better times returned. Nine years later I’m still driving the 330, despite having a few good years. The car is 12 years old 210,000 KMs. I will drive it in the ground. One more thing, we want from two cars in 2008 to one car with no plans of expanding the fleet. I expect to lower car sales to be permanent. This why immigration is very important for the economy. It is all about growth. If two people die and their two kids enter the economy, you have a brief blip after which you are back to the same rate of consumption as before. If you want a growth that is positive at all times, you need newer people to pretty much acquire all the goods that one has acquired in the economy after being around for a while. This is true for housing and cars. the safety factor.We feel a little taller in an escape rather then a cruze. The milage difference isn’t a big deal and monthly costs arn’t much higher. Back in the 70s and 80s, pick up trucks were cheaper than cars, at least that was my impression back then. Even in the 90s there wasn’t a huge differential, as I bought my daughter a nice Chevy Silverado she always had her heart set on, and no way I would have gotten her one if it was that out of line with a car. Now pick up trucks are huge and incredibly expensive. I suspect it has everything to do with interest rates. When anything gets way out of whack, like this, just see where and now the government is affecting it. Small pickups were as inexpensive as basic little hatchbacks in the 80s and a lot of people used them as cheap commuters. Of course that was when they were bare-bones 2-seaters with no airbags, no AC and wind-up windows. There was an inherent simplicity to 1980’s pickup trucks. You were lucky if they had AC on them. Now the gadgets are AC, Automatic as standard, cruise control, back up cameras, electric windows, electric side mirrors, under seat heating elements, in car WIFI, GPS navigation systems “OnStar” automatic airbags etc, all sort of ticky tacky crap that you really really don’t need. Yet there you have it.. The trucks now are way more expensive than cars. … and the internal CPU not only controls vehicle functionality, it records everything the vehicle does. My 1995 was the last year this spying capability was not installed. the trend in America for the pas 25 years or so is bigger cars, bigger houses and bigger people. Look at all of the obese people now. I don’t mean 20 lbs. over weight I mean fat! so I guess big trucks go along with that. Toyota quit making their single cab a few years back. Not big enough for all of the big people I guess. I looked at the Cruze last year thinking I could get a deal with all this carmageddon going on, but didn’t see the discounting I was expecting. Much more discounting was going on at Hyundai and VW. I held off on my purchase due to an outside issue. Check back at the end of the month… 28th, 29th, 30th. My wife has a 2013 Cruze. We’ve never had a problem with it. She’s driven it little: only 30,000 miles in less than five years. My old car’s AC went kaput – a $1,400 repair, which is about what Kelly Blue Book said the car was worth when traded in to a dealer. I looked at the new Cruzes, but buying a second car so similar to my wife’s car seemed boring. I also wasn’t crazy for the colors (e.g., Kinetic Blue). I ended up buying a Hyundai Elantra. I didn’t get into a serious discussion with the Chevy salesmen. They didn’t sound like they would offer a reasonable amount for my trade-in. I hope GM is graced with years of poor sales. Why would anyone buy one of their junk products? American consumers are just plain broke and stupid. This is why Tariffs are needed. Goods sold here should be made here, due to our Standards of Living. NAFTA should be reduced to USA&CAN; and MEX should be regrouped in the “Rest of the Americas” Trade Region. BTW, GMC are profitable in CHN. The same ol’ story of cheap jobs in Mexico while jobs get slashed in the expensive labour force. How dare the simple peasants ask for a wage that covers the inflation in their every day expenses. As for how the finances look, I am sure car manufacturers won’t go bankrupt until they have their Facebook moment. All the fancy tech is collecting personal data from all modern cars movements. Your personal phone connecting to Onstar = access. They don’t have to buy your data, but they can sell it. GM in Europe and the UK is getting smaller by the day. It’s a shame as the cars are pretty reliable. The shame is that the new models brought out don’t get you excited whatsoever. GM has pretty much pulled out of Europe. They sold Opel/Vauxhall to PSA last year. What cars are they still selling there? I think they may still sell a few niche vehicles, like the Corvette and Camaro.